The first time I viewed Rick Griffin’s artwork was in an issue of one of those 60’s hot rod magazines. Ed “Big Daddy” Roth, a 50s - 60s artist, cartooonist and pinstriper best known for his grotesque caricatures, typified by Rat Fink-- had created a family of “Monster” icons driving period Chevy's or Fords in blazing colors. Roth's grotesque monster icons eventually appeared on the backs of sweatshirts and t-shirts. 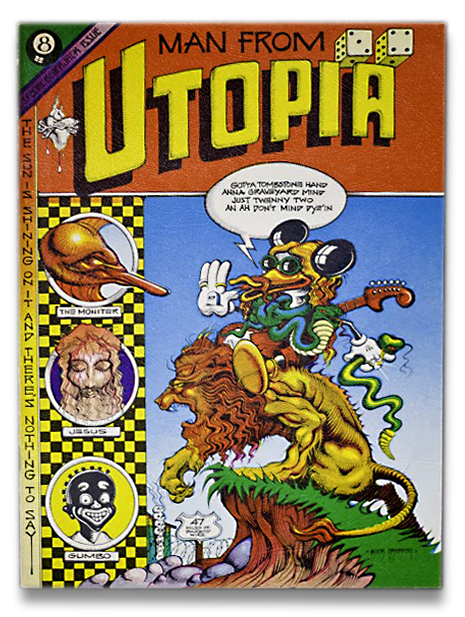 Rick Griffin had created some artwork for Roth, who had at the time become famous for the “Rat Fink” icon he created. Later on I noted that Rick’s art began to appear in issues of SURFER Magazine. His self-revealing cartoon, “Murphy,” a clean-cut teenage surfer of the 60’s, would decades later become a skeleton icon riding majestic ocean waves. As the sixties progressed and the San Francisco music scene evolved, Rick Griffin, who had become an original icon of the counter-culture movement at the time, was called upon to create promotional concert posters for the Fillmore West and other San Francisco Bay Area shows. In addition he was asked to create rock album covers (for such bands as the Grateful Dead) at a prodigious rate. At that time I was adding to my record collection as fast as I could, and many of those albums I purchased had covers penned and painted by Rick Griffin. For example, I really took to the silverfish glare on the first Quicksilver Messenger Service album cover. In the late 60’s Griffin got a job with SURFER Magazine and returned to his roots. By now Rick had a family, and one of his daughters wound up in my mother’s kindergarten class. She told me about this quirky long-haired man, and I knew it was Griffin right away. Money was hard to come by that year, and Rick offered to let my mother choose a piece of art from his studio. My mother picked a small drawing that happened to be a poignant black and white self-portrait. It was one of his favorites, too. My mother had explained to Rick that she felt one of his daughters was gifted and it made him very happy. Later on I met up with Rick’s wife, Ida and her daughters at of Rick’s more noteworthy exhibitions in Laguna Beach. Hurley™ surf wear put a lot into promoting the exhibition, and it was well-attended all summer. The docent at the museum was surprised it did so well. Over the years I collected many prized Rick Griffin memorabilia; many of them second hand. Looking back, I wish I had purchased the “Save our Mother Ocean” t-shirt fro the 70’s. However, I did have a couple of other cool t-shirts from that era. At one point I hired Rick to draw a black and white poster to promote my surfing project, “Surf Lines,” which illustrates a Hopi Indian with wings on his back, riding a curled ocean wave tube. If you are a Griffin lover and explore my website, you’ll find other fascinating artwork gems. I share my collection with the world so others may come to appreciate Rick’s genius. I will gladly remove any item that violates someone’s copyright. Copyright © 2019 Surf & Rock Art. Powered by WordPress. Theme: Spacious by ThemeGrill.